Should the U.S. Build an 'ISIS Wall'? Of all the reasons a majority of Americans support the plan of businessman and U.S. presidential candidate Donald Trump to "build a wall" along the U.S.-Mexico border, perhaps the most critical is to avoid letting terrorists into the country. Drugs enter, the victims of traffickers enter, but the most imminent danger comes from operatives of the Islamic State (ISIS) and like-minded groups that are trying to use this porous border as a way to smuggle weapons of mass destruction (WMDs) into the United States and launch terror attacks that could make 9/11 seem like a morning in May. Just last week, "One of the American men accused in Minnesota of trying to join the Islamic State group wanted to open up routes from Syria to the U.S. through Mexico... Guled Ali Omar told the ISIS members about the route so that it could be used to send members to America to carry out terrorist attacks, prosecutors alleged in a document." ISIS, however, did not need to be told by Ali about the route. Nearly a year earlier, ISIS explored options on how it could smuggle a WMD "into the U.S. through Mexico by using existing trafficking networks in Latin America." Let me throw a hypothetical operation onto the table. The Islamic State has billions of dollars in the bank, so they call on their wilāyah [province] in Pakistan to purchase a nuclear device through weapons dealers with links to corrupt officials in the region. ... The weapon is then transported over land until it makes it to Libya, where the mujāhidīn [jihadis] move it south to Nigeria. Drug shipments from Columbia bound for Europe pass through West Africa, so moving other types of contraband from East to West is just as possible. The nuke and accompanying mujāhidīn arrive on the shorelines of South America and are transported through the porous borders of Central America before arriving in Mexico and up to the border with the United States. From there it's just a quick hop through a smuggling tunnel and hey presto, they're mingling with another 12 million 'illegal' aliens in America with a nuclear bomb in the trunk of their car. The ISIS publication added that if not a nuke, "a few thousand tons of ammonium nitrate explosive," which is easily manufactured, could be smuggled. Four pounds of anthrax — in a suitcase this big — carried by a fighter through tunnels from Mexico into the U.S. are guaranteed to kill 330,000 Americans within a single hour if it is properly spread in population centers there. What a horrifying idea; 9/11 will be small change in comparison. Am I right? There is no need for airplanes, conspiracies, timings and so on. One person, with the courage to carry 4 pounds of anthrax, will go to the White House lawn, and will spread this 'confetti' all over them, and then we'll do these cries of joy. It will turn into a real celebration. Plans aside, ISIS and other Islamic terrorists are based in and coming from Mexico. The evidence is piling up. 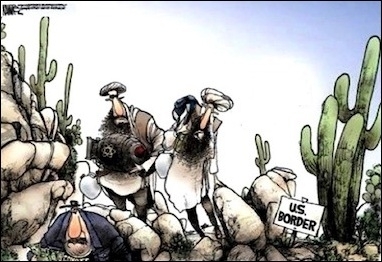 In August 2014, Judicial Watch reported that ISIS was "operating in the Mexican border city of Ciudad Juarez and planning to attack the United States with car bombs or other vehicle borne improvised explosive devices." 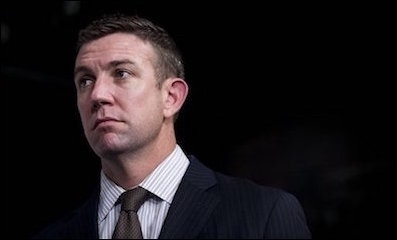 Months later in April 2015, ISIS was exposed operating in the northern Mexican state of Chihuahua — eight miles from the U.S.
Rep. Duncan Hunter: "If you really want to protect Americans from ISIS, you secure the southern border. It's that simple." In October 2014, Rep. Duncan Hunter (R-Calif) said, "I know that at least 10 ISIS fighters have been caught coming across the Mexican border in Texas." The Department of Homeland Security (DHS) emphatically denied Hunter's claims, called them "categorically false" and added that "no credible intelligence to suggest terrorist organizations are actively plotting to cross the southwest border." Days later, however, it was confirmed that "4 ISIS Terrorists" were arrested crossing the border into Texas. On September 20, 2015, "U.S. Border Patrol nabbed two Pakistani men with ties to terrorism at the U.S.-Mexico border. ... Both men ... took advantage of smuggling networks or other routes increasingly used by Central American illegal immigrants to sneak into the U.S."
This is uncomfortably reminiscent of the scenario outlined in the ISIS magazine: after naming Pakistan as the nation from which to acquire nukes — the two men arrested for "ties to terrorism" were from Pakistan — the Dabiq excerpt explained: "The nuke and accompanying mujāhidīn... are transported through the porous borders of Central America before arriving in Mexico and up to the border with the United States. From there it's just a quick hop through a smuggling tunnel." 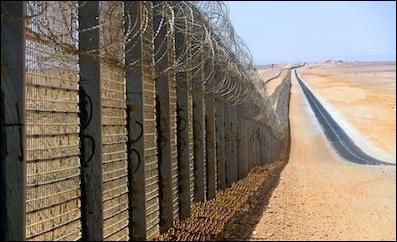 The Israeli-built border fence between Israel and Egypt, completed in December 2013, put a complete stop to illegal infiltration from Egypt into Israel. On December 2, 2015, "A Middle Eastern woman was caught surveilling a U.S. port of entry on the Mexican border holding a sketchbook with Arabic writing and drawings of the facility and its security system." Around the same time, "five young Middle Eastern men were apprehended by the U.S. Border Patrol in Amado, an Arizona town situated about 30 miles from the Mexican border. Two of the men were carrying stainless steel cylinders in backpacks..."
These arrests clearly indicate that Islamic terrorists are crossing the border into the U.S. For every illegal person caught, how many are not? One estimate says that at best only half of those illegally crossing the border are ever apprehended. Under Obama's presidency alone, 2.5 million illegals have crossed the border. And those are just the ones we know about. How many of these are ISIS operatives, sympathizers or facilitators? Border guards cannot even be "especially alert" for terrorists: many easily blend in with native Mexicans. Securing the U.S.-Mexico border is more urgent than we think. Three facts are undisputed: 1) ISIS and other terrorist groups see Mexico as a launching pad for terrorist acts in the U.S.; 2) ISIS and other terrorist groups have bases of operations in Mexico; 3) Members of ISIS and other terrorist groups have been caught trying to enter through the border. If you really want to protect Americans from ISIS, you secure the southern border. It's that simple. ISIS doesn't have a navy, they don't have an air force, they don't have nuclear weapons. The only way that ISIS is going to harm Americans is by coming in through the southern border — which they already have. Just as before 9/11 — when U.S. leadership had received ample warnings of a spectacular terrorist attack targeting the U.S. — this problem may well be ignored until a spectacular attack occurs: San Bernardino was apparently too small, it did not count. Then, it will be more of the usual from the comatose media and many politicians: "shock," hand-wringing, and appeals against "Islamophobia." Securing the U.S.-Mexico border — with an electronic fence, which has worked so effectively in Israel — is more urgent than we think.